The skill to place your pieces on the best squares require that you understand the circumstances in which they thrive. In other words, to help your pieces reach their potential you must have knowledge of their particular strengths and weaknesses. As the leader and manager of your pieces it is your responsibility to lead them to glory! They can only help you if you help them. Their potential are locked up inside them – and it is your task to help them make their best contribution in the interest of the team. The next few lessons will help you get a good understanding of the “personalities” of your pieces. This understanding will help you create the best circumstances for your pieces and avoid situations that weaken their usefulness. What the pawns lack in strength they make up in their numbers. Pawns have a big effect on the whole game since they have a significant impact on the mobility of the pieces and they keep the enemy pieces out of their territory. Pawns form a solid shield of defense when they stand together. They are also very effective in controlling important squares and chasing enemy pieces away from their territory. Promoting one of them to a new queen will usually result in winning the game. The first example shows how effective pawns are in preventing enemy-pieces from improving their development or entering your territory. Note that the black knight can’t move to b4, d4 or e5 since the white pawns control those squares. If white plays f4-f5 now it would be a strategic error since it will allow the black knight to come to the e5-square. Pawns are the main defenders of your territory. You should only push them further up the board when your pieces are ready to protect the undefended squares behind them. Nd2+ wins the Nb3. Or if white plays Nxd2 then a2-pawn will promote. Pawns are the main defenders of your pieces and of squares in your territory. Pawns are effective in restricting the movements of enemy pieces. Pawns are useful in gaining control of important squares. Passed pawns require your opponent to use a piece to stop the pawn – which means that piece is forced into a defensive role. Pawns cannot move backwards. This means the squares next to and behind them become permanently weakened once they move forward. Pawns become weak once they cannot support each other anymore. Weakened pawns need pieces to support them – which isn’t ideal since you don’t want your pieces to be forced into positions where they are forced into defensive positions. The example below illustrates a main weakness of the pawns – a weak pawn needs support from the pieces. In this position the material is equal but black has a weak pawn on c6 that needs support from the pieces. If black wants to save the c6-pawn, he will be forced to retreat his knight to e7 into a defensive position. Pawns are slow, they can’t run away – when they aren’t defended by other pawns, they are weak, and they require support from the pieces. It is not ideal when your pieces must defend pawns since ideally they should be used to put pressure on your opponent. When you have a weak pawn as in this example, you will often face a tough decision – do you defend the pawn or do you sacrifice it and rather try to improve the development of your pieces? In the particular position above, black can’t make threats with his pieces in any case (white will answer Rb8 with b3 – which only helps white), so he might as well use them to defend his material by playing Ne7, followed by Rc7 and Rfc8. The second example shows clearly the possibly devastating consequences of advancing your pawns carelessly. In the example below the squares near black’s king has been severely weakened by pushing the g-pawn to g6. Black probably thought he could force the white Nh5 to retreat, but instead of g7-g6? he should rather have played a counter-attacking move such as Bg5. The consequences of all pawn moves should be considered carefully (while keeping in mind they can never move back again). A weak pawn needs supports from your pieces. It isn’t ideal when a higher-valued piece must “baby-sit” a pawn. Since pawns can’t move backwards, the squares next to them and behind them are weakened when they move forward. Pawns can severely restrict the mobility of your pieces. 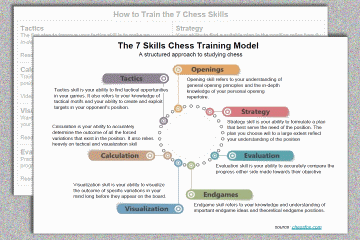 Plan your pawn-moves well to minimize their impact on your pieces.